Backyard Adventure playhouses are available for the lowest price and free shipping when you order at Family Leisure. Browse the new space saving collection of play sets! Are you looking for a jungle gym, but cannot wrap your mind around forfeiting most of your precious backyard space to the cause? You are not alone. Many play gym shoppers feel the same way. They want their kids to enjoy swinging, climbing, sliding and imagining without sacrificing their yardage. The Adventure Treehouse Junior Space Saver is made in response to this demand. It features the well-loved Adventure Treehouse Junior base, which is 5’ tall and features a 45’’ x 64’’ fort deck space that is covered with a tarp roof. 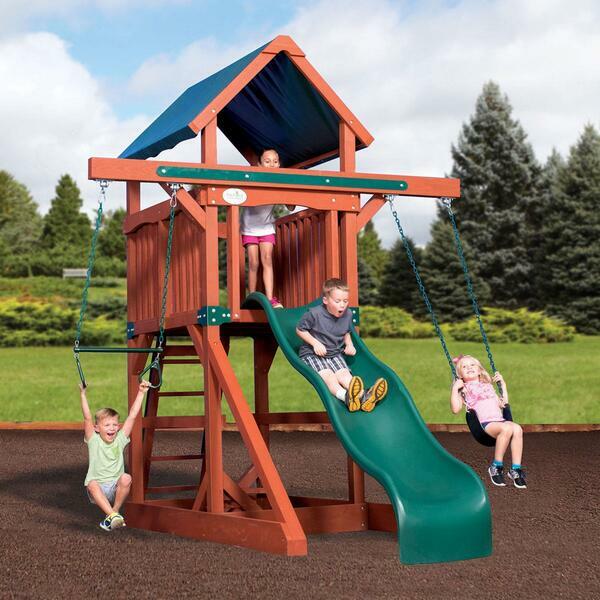 An accessory arm extends from the fort, and allows space for two accessories of your choosing, whether that’s two belt swings, a swing and a trapeze, a toddler swing, a tire swing, a glider or something else. The space saver includes a slide, too. Though small, the Adventure Treehouse Space Saver is mighty to entertain active kids for hours on end.